Today, Mayor Frank G. Jackson announced the parade, park use, and speaker’s platform regulations as well as the revised stationary and mobile vendor regulations for the Republican National Convention. Earlier this morning, the city’s Board of Control approved these documents. 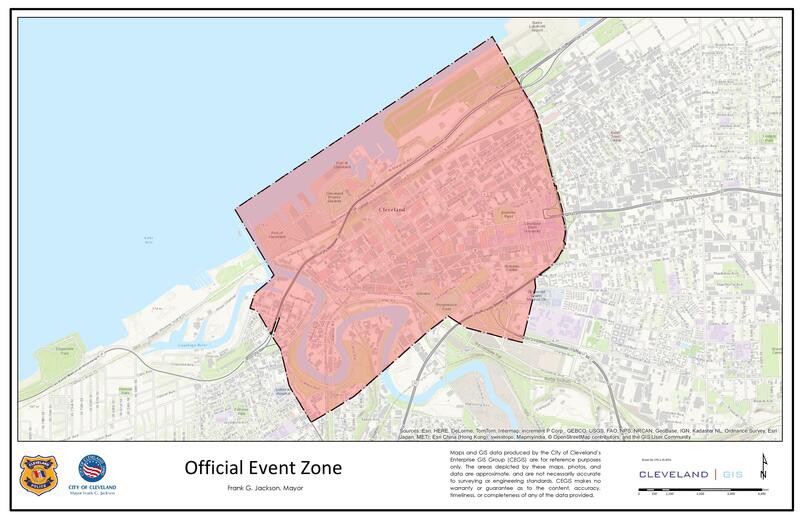 The city’s official event zone is outlined on this map , excluding spaces designated as the secure zone. 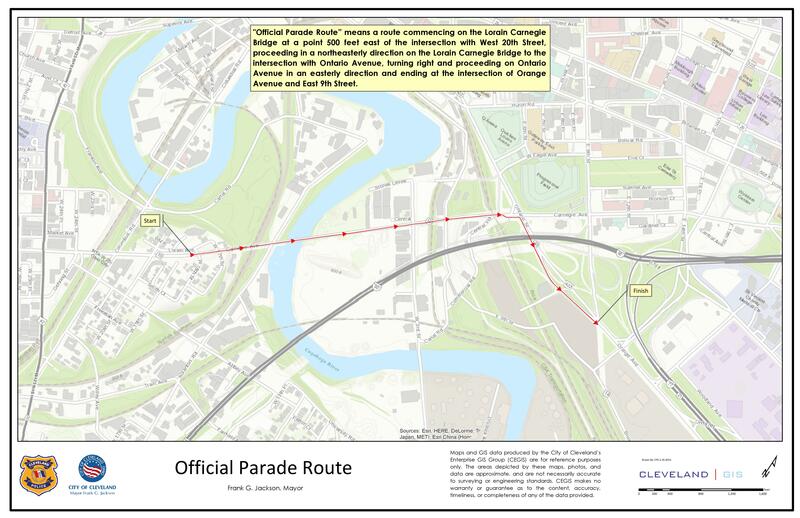 Official Parade Permits: The City of Cleveland will be issuing scheduled parade permits with route times expected to run from 2:00 p.m. to 4:00 p.m. on Monday, July 18, 2016 and the last parade will end by 5:00 p.m. On the following dates parades will run from from 9:00 a.m. to 1:00 p.m. and the last parade is expected to end no later than 2:00 p.m.
As a part of the parade route the Lorain/Carnegie Bridge will be closed to vehicular traffic starting on Sunday, July 17th at 12:01 a.m. and will remain closed until Saturday, July 23rd at 12:01 a.m.
Official Applications: The on-line application process will open on May 31, 2016, at noon. The filing deadline for all applications and registrations is 5:00 p.m. on July 8, 2016. Official Park Use Permits will allow the placement of Public Art and Public Installations on Perk Plaza and Willard Park. 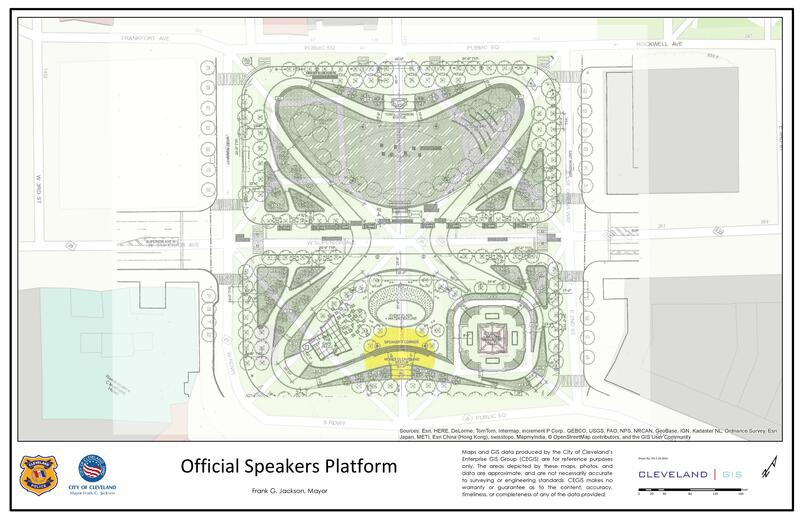 An Official Speakers Platform will be in place on Public Square and speakers may sign up for 30 minute time slots scheduled from 9:30 a.m. to 6:00 p.m. and the last speaking event will be scheduled to end by 6:30 p.m. each day of the Convention. Official Revised Mobile and Stationary Vendor Zones: The Board of Control approved revised mobile and stationary vendor routes and locations to accommodate the vendors during the Republican National Convention. Mayor Jackson also introduced Assistant Special Agent in Charge, Ronald L. Rowe, Jr. and Assistant to the Special Agent in Charge, U.S. Secret Service Dignitary Protective Division, Timothy Lea, who has been working hand-in-hand with the City, Committee on Arrangements and Host Committee throughout the planning process.